Zen Buddhism and the poetry of Fr. Tim Eden’s homily on the Gospel for the First Sunday of Lent came together movingly in the Mystical Rose Oratory today. Buddhism tells us about that little imaginary bird that sits on our shoulder always, a reminder that death claims us all, usually without warning. So we would do well to live each day mindful of the immediacy of the life we have in front of us, but ready to embark on that next journey at a moment’s notice. I find myself talking to that little bird often. Driven to the desert, Jesus was met by “wild beasts” but he was also ministered to by “angels.” This is life as most of us know it. An on-going encounter with wild beasts and angels. And death always waiting to claim us. Any of us. At any time. The only sane, truly Christ-like response is to be attentive to God in the “power of the present moment.” Fr. Tim offered the notion that while we come from different pasts and have no idea what our separate futures might hold, the “here and the now” is a great equalizer. We are one in the “here and now.” It is up to us to seize the moment, savor its pleasures, be open to finding God in small things, and become part of the building of a better world by being truly and fully attentive to each other. Death may be inevitable, but it need not be paralyzing. 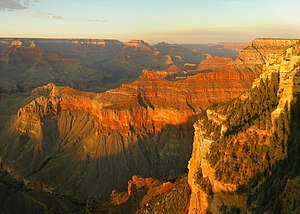 We need to live life, not as in the blur of the Indy 500 but in the slow immersion in the wonders of nature that a walk on the rim of the Grand Canyon might provide: stopping to marvel at a sunset or the flight of a flock of swallows. Haven’t been to either the Indy 500 or the Grand Canyon, Fr. Tim, but you conjure up a great word picture in the here and now. A wonderful Lenten blessing. Thank you.